Hungarian Porkolt | Authentic Instant Pot Hungarian Goulash! 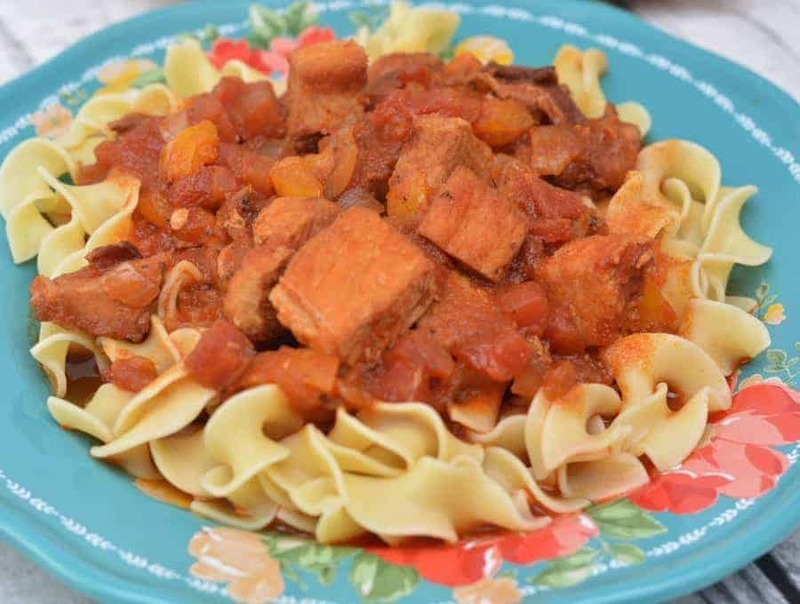 This recipe for a Pressure Cooker Hungarian Porkolt, or Hungarian Goulash came to me from Adri Lewis, who I met via my blog and my facebook page. Without her, I’d have had no idea how to make this authentically. I mean, at all. She posted this on the Twosleevers page and it looked so delicious that I immediately asked her if I could share it with all of you. I was so happy when she agreed, and here we are. I mean, how many different recipes have you seen all over social media that bill themselves as Hungarian Goulash? It’s hard to know what’s authentic and what’s not. Adri’s recipe matches up very closely with what I’ve read about Authentic Hungarian Goulash so I’m delighted to be able to share it with you. Want to try another amazing authentic dish in your Instant Pot? 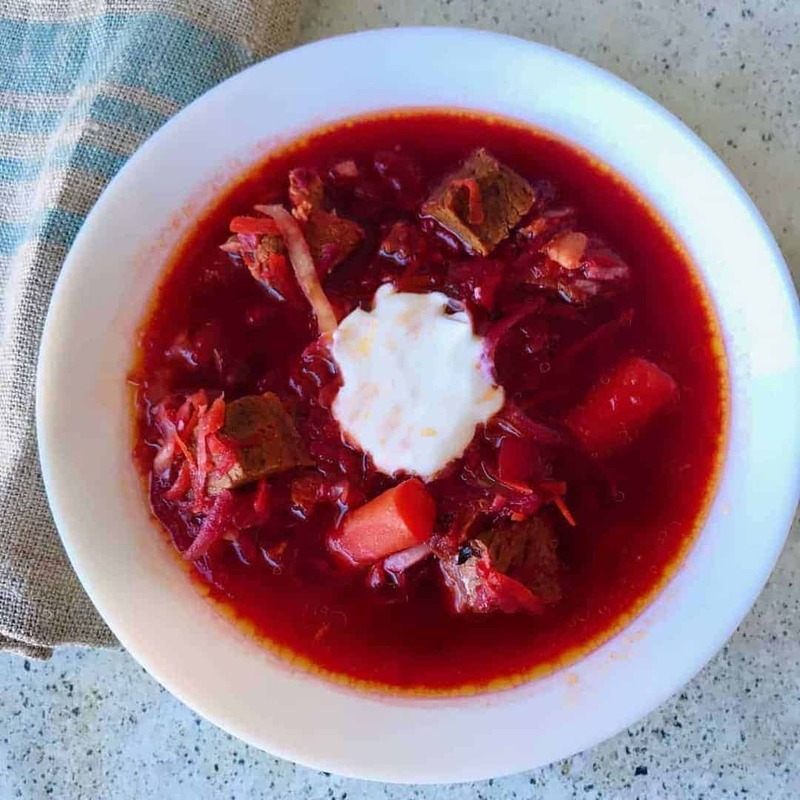 Try out this Authentic Russian Borscht! It’s delicious! 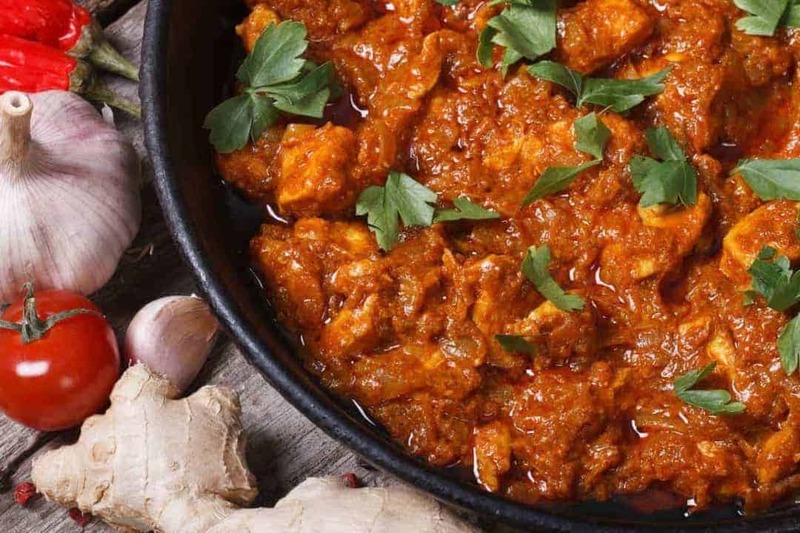 Another fantastic international recipe to try in your Instant Pot or pressure cooker is my Chicken Vindaloo. Make this delicious dish from scratch in less than an hour! It’s basically Hungarian Goulash. It’s real Hungarian Goulash, not whatever is billed as Goulash across any old recipe. It’s a thick meat stew, with meat, onions, and a few other vegetables, fragranced and flavored with Hungarian Paprika, and cooked until it’s soft and fork-tender. The pressure cooker is perfect for tenderizing meat and infusing the flavor of the aromatics and the sweet paprika all into the stew. 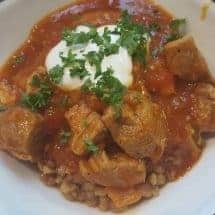 So if you’ve really wanted to try an authentic Hungarian Goulash or Hungarian Porkolt, here’s a super simple recipe that should work for you. Did you also notice that this is a low carb dish if you don’t eat the Tarhonya? Keto-Friendly? Yup. Bonus! Enjoy. 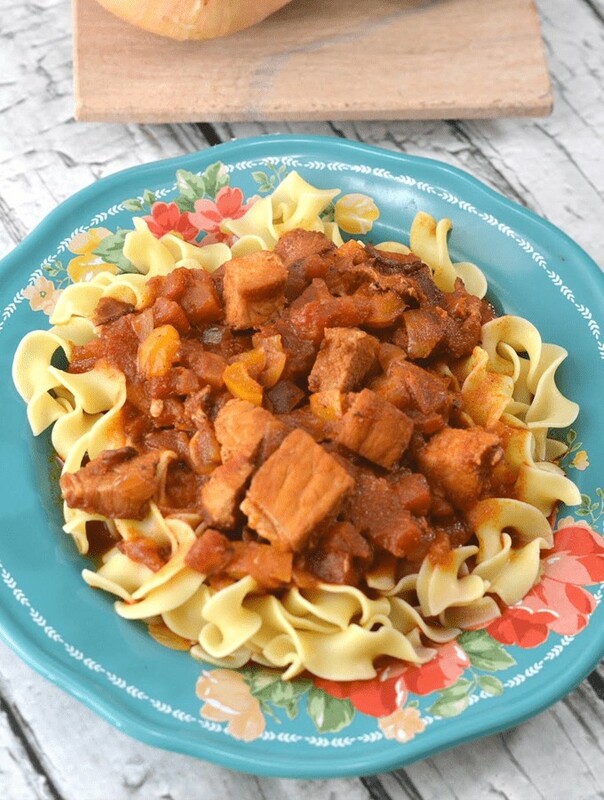 Use your Instant Pot to make amazing and tender Hungarian Porkolt, or Hungarian Goulash! It's simple and delicious, and better yet it's authentic! Sprinkle meat chunks with salt and pepper to taste. Turn your Instant Pot or pressure cooker to Sauté wait until hot, then add cooking oil. Brown the meat – leave it alone for a few minutes to get a nice color. Remove to a bowl when nicely browned , and add the onion and bell pepper to your pressure cooker. Cook for about 5 minutes. Push the meat/stew button and adjust time to 25 minutes. Allow it to release pressure naturally for 10 minutes, and then release any remaining pressure. Serve over starch of your choice with a big dollop of sour cream. Traditionally it would be Tarhonya but you can also use potatoes or rice. I have stew beef, can I use this? Would you substitute beef broth? Thanks! I enjoyed the simplicity of the recipe, and after weeks of eating mostly Indian and Mexican food, I took to hear the idea to spice up the recipe a bit. I used an extremely large onion, more garlic, and 1/2 teaspoon caraway seeds. Next time I’ll add sauteed mushrooms (which I’m sure is not traditional). I served with barley which was nice. This is a very quick to cook recipe, very savory and satisfying. I made this tonight and found it to be a bit bland. Looked up other recipes and see that caraway, balsamic, more onion and garlic, bay leaves, etc., were used. I think I’ll add these ingredients next time. Maybe these ingredients aren’t Keto, but I think they are needed. I’m very new to the instant pot and slavishly followed your recipe and instructions 😝. I set the timer for 25 mins and after 10 released the steam valve. But, the cooker did not start cooking for at least another 20 mins……..and then kicked in and flashed the 25 mins! I”m not quite clear when it started to come to pressure? I’m wondering if you accidentally hit the delay timer rather than the pressure/manual button? it kinda sounds like it. You’re welcome! I hope you guys enjoy it. Would it be possible to use pot-in-pot to cook the tarhonya? That is a very interesting thought. My concern is that it would overcook in the 25-30 minutes the meat takes to cook.